Over the past several years, my work for PWD has focused increasingly on the Schuylkill River watershed. The following is a brief overview of some of the issues I have been researching, with links to documents, maps and illustrations. I recently completed a more comprehensive historical overview for the Fairmount Park Commission, and hope to add that paper to Philly H2O at some future date. While I welcome use of this material (and other pages on this site) by classroom teachers and other educators, I would be remiss not to mention the wonderful educational programs that continue to be developed by the teachers of the Fairmount Water Works, administered by PWD. More Schuylkill River material in PhillyH2O can be found by using the Google search box on the home page, or looking in the Schuylkill section of the Archives, accessed with the link at the left. "Map of Philadelphia showing present intakes, pumping stations and reservoirs together with proposed filters and connections. Noyes & Hazen, Consulting Engineers, Boston, Mass., Aug. 1896"
Schuylkill River. Wissahickon Creek, Phila., Pa. to Norristown, Pa. Surveyed by J. W. Thompson, Junior Engineer, Aug. to Dec. 1913. L. D. Shuman, Assistant Engineer. In 18 sheets. 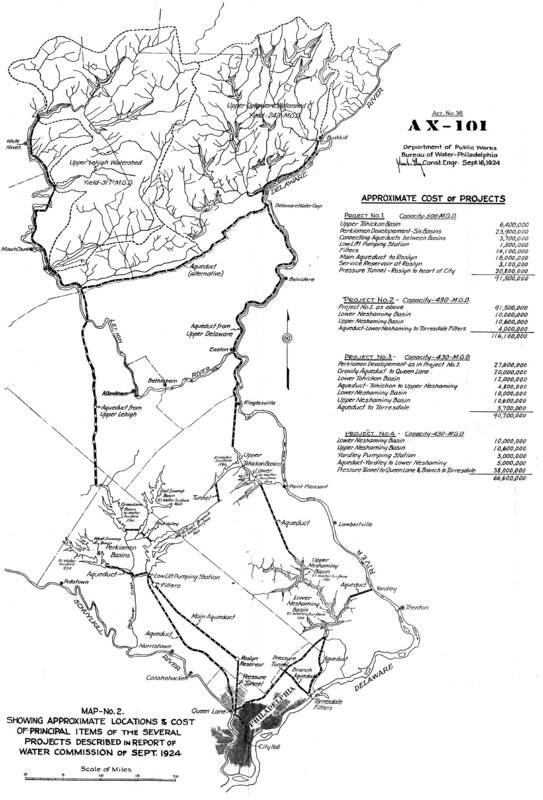 [Includes Index map (Sheet 14), descriptions of triangulation stations (Sheets 15, 16 and 17) and Freshet Data (Sheet 18) listing all the major floods affecting this section of the river to 1913. Maps show topography of shoreline, soundings, footprints of riverfront buildings, railroads, canal, locks, dams, tributary streams, and many other details. A River Again: The Story of the Schuylkill River Project, by Chari Towne of the Delaware Riverkeeper Network. Link to a free PDF download page of this book, which documents the state and federal project in the 1940s and 1950s to remove millions of tons of coal waste that was choking the Schuylkill River. Since 1801, when Philadelphia first tapped the Schuylkill River as its water supply, maintaining the quality of the river's water has been an acute concern of city officials. 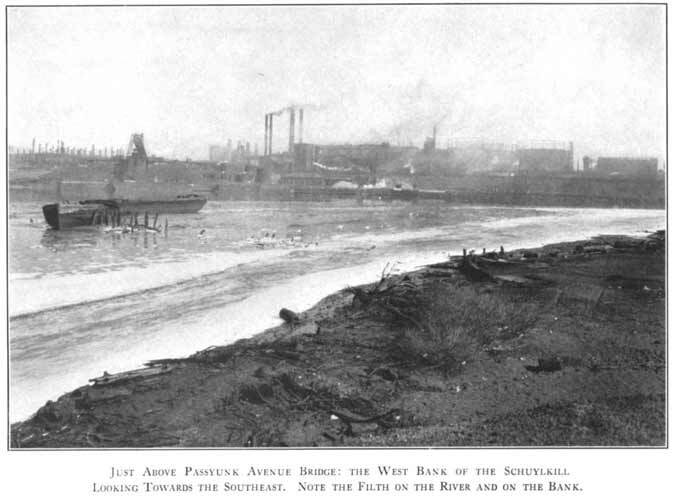 As industry began to encroach on the riverfront upstream from the Water Works at Fairmount, laws were passed which attempted to prevent pollution of the water. An 1828 Pennsylvania law, in its quaint legalese, mandated a fine of $5 to $50 for "any person or persons [who] willfully take, lead, conduct, or carry off, or shall knowingly suffer or permit to be taken, led, conducted, or carried off, any offal or any putrid, noxious, or offensive matter, from any dye house, still house, brew house, or tan yard, or from any manufactory whatever, into that part of the river Schuylkill which is between the dam at Flat Rock [above Manayunk] and the dam at Fair Mount." The act further forbade pollution of river close to the Fairmount Water Works with "any dead animal, or any putrid or corrupt thing whatsoever, or any noxious or offensive matter of any kind." It also outlawed swimming, by people or dogs, within 100 yards of the head race, which conducted water into the Fairmount Water Works. 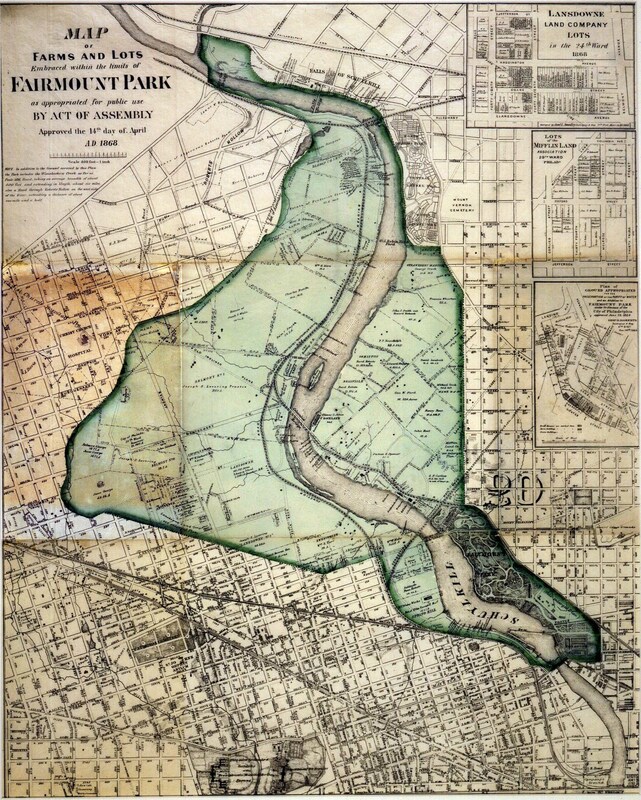 The creation of Fairmount Park, a few years after the end of the Civil War, was intended to protect the quality of the river water being drawn at Fairmount, and was a direct response to the impact of industrial development along the Schuylkill. Around that time another law made its way to the legislature, which extended the area to be kept free of pollution upstream to Norristown and increased the fines from $100 to $1000. The following amended list of pollution sources reflected the tremendous expansion in industry along the river by this time: "Any carrion or carcass of any dead horse or animal, or any excrement or filth from any slaughterhouse, vault, well, sink, culvert, privy or necessary, any offal or putrid or noxious matter from any dye house, still house, tan yard, or manufactory or mill; any refuse from any coal oil refinery, gas works; or any other noxious matter or liquid whatever calculated to render the water of said river impure." proposed legislation." The petition considered the pollution of the Schuylkill an unavoidable cost of doing business, which manufacturers thought the larger society should be willing to absorb, considering the economic benefits their factories provided. In his annual report for 1884 [pages 62-63], William Ludlow, the Chief Engineer of the Philadelphia Water Department, said this about the river: "The history of the Schuylkill is both interesting and instructive. In earlier days a noble river with a bountiful and healthful drainage area of woodland, mountain and meadow, pouring a powerful and fairly equable current of pure water through its channel, the occupancy of its valley and the growth and development of population and industries from source to mouth have greatly modified its characteristics. Generation after generation have made fresh inroads upon its resources and added its quota of varied pollution, until at length the river, whose pure volume for a long period was able to eliminate the evidence of man's careless work and presence, and which even yet might have continued to do so were it not, Samson-like, shorn of its power of conservation by the ruthless cutting away of the forests and clearing of the land upon which it depended to equalize its flow, has become a sewage and trade-polluted stream whose failing volume in seasons of drought is unequal to the nauseous task of digesting and disposing of the extraneous and dangerous matters with which it is surcharged." An intercepting sewer was built along the Schuylkill within Philadelphia beginning in the 1880s, to capture the sewage being dumped above Fairmount, but the river continued to be fouled by wastes from upstream sources. This interceptor emptied just below the Fairmount Dam, and by 1920s it was disgorging the sewage from a population of 500,000 into the tidal portion of the river. John E. Allen, the city's leading sewage engineer of the time, wrote in 1929 that "the complete removal of all sewage discharge from the Schuylkill River below Fairmount Dam is imperative. During certain periods of the year, the entire fresh water increment, which should overflow the Fairmount Dam, is absorbed for water supply purposes and the entire River below the Dam becomes an immense septic tank, the surface of which rises and falls with the tide and has a horizontal movement of only 1200 feet back and forth. Advance of its water into the Delaware River takes place only during times of sufficient rainfall to cause a movement of water over the Dam." The Board of Health, in its 1875 Annual Report (page 23), anticipated this problem in this discussion of the Schuylkill intercepting sewer: "There are sanitary advantages to be gained by the construction of such a sewer, independent from those which must result from the improvement in the quality of the water to be used for domestic purposes. The Schuylkill River, flowing as it does through the city, should be prevented from being fouled by sewage, even should the water not be used for drinking purposes. The moderate volume of water and gentle current favor a deposition of the organic constituents of the sewage, which undergo decomposition, and evolve poisonous gases. This would be more likely to occur in the Summer season, when the receding of the water from the banks would leave a filth-sodden surface exposed to the solar rays. The intercepting sewer (on each side of the river) could be continued to a point below the city, where it might empty into the mouth of the Schuylkill or the greater waters of the Delaware, only at the ebbing tide, if possible. The Schuylkill below the dam would then be purged of its foulness, and a nuisance which is becoming worse every day would thus be effectually abated. In the course of time [sewage treatment] works might be erected at the termination of the intercepting sewers on the Delaware, where the sewage could be purified and utilized [as fertilizer], and the effluent water, deprived of its impurities, discharged into the river without producing any injurious effects. Because we cannot keep all sewage out of the Schuylkill River is no reason why we should not keep as much out as possible, the most dangerous influx being within city limits, and therefore within city control." In 1866 Philadelphia undertook the first of numerous surveys in search of a new water supply. Most of these surveys, conducted periodically through 1946, recommended that the increasingly polluted Schuylkill and Delaware rivers be abandoned as water sources, and that upstate streams be dammed and this cleaner water brought to the city by aqueduct. 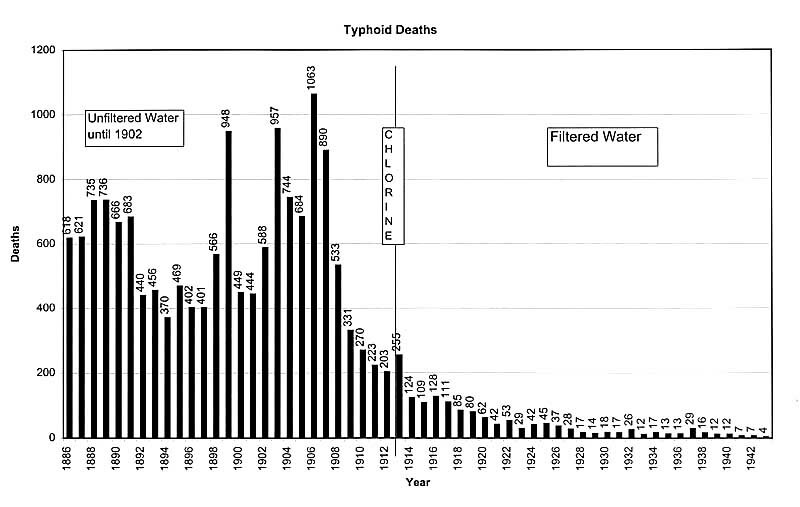 None of these recommendations were ever followed, for various economic and political reasons, and thousands of citizens died of typhoid fever between the 1870s and the first part of the 20th century. Finally, water filtration plants, combined with chlorination of the supply, virtually eliminated disease-carrying bacteria from the water supply. Technology made the water safe to drink, if somewhat harsh to the palate, but it would be decades before technology was employed to remove sewage and other wastes from the rivers. The 1905 Clean Streams Law mandated the end to sewage pollution of the Pennsylvania's streams. 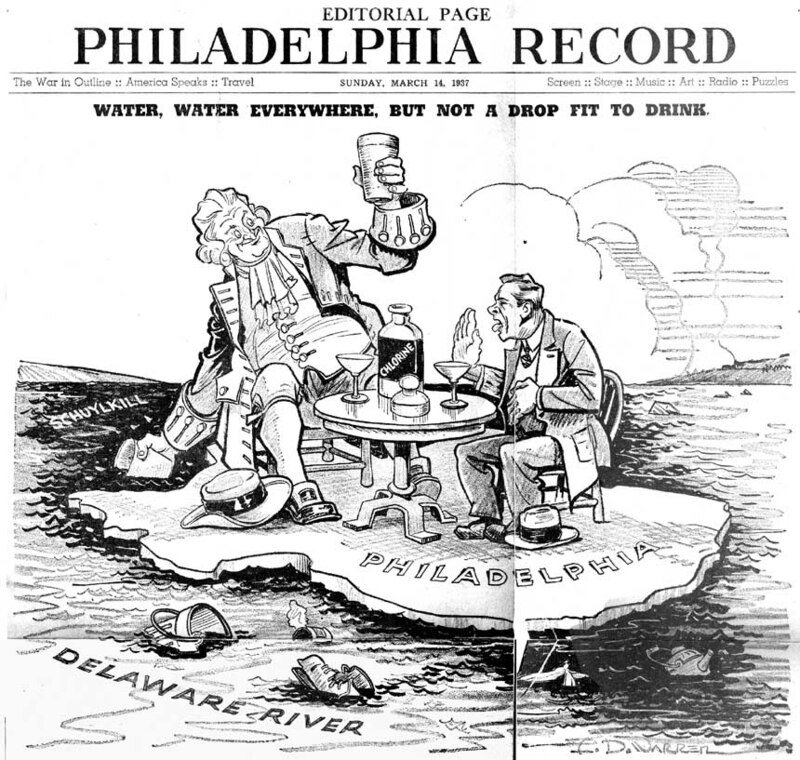 Under this mandate, Philadelphia published its "Plan for the Collection and Treatment of Sewage" in 1914, but implementation of that plan took the next 50 years, during which time sewage pollution of the City's rivers continued. In the 1950s, after delays caused by political intransigence, the lean years of the Depression, and the diversion of public works funds into two World War efforts, the City finally finished the three sewage treatment plants outlined in the 1914 plan. The system of giant interceptor sewers (the largest measure more than 20 feet across), which "intercept" the raw sewage before it reaches the rivers and carries it to the plants, took another ten years to finish.